We build numerous Air Filtration control panels of different configurations. 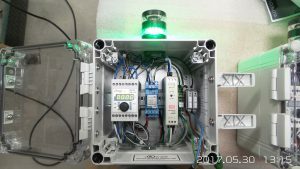 These systems range from simple starters to complex PLC and VFD panels. A large multinational we work with build extreme temperature and pressure valves for the boiler industry. For them, we fabricate a monitoring and controls system for their equipment. Hegwood Electric is a UL 698A and UL NNNY registered panel shop. We have built a number of intrinsically safe and hazardous location control panels. Hegwood Electric has built custom machine control panels for years. Whether is for testing purposes, golf ball conveying, flexible metal shafts, or hydraulic machines, we have satisfied customers located around the world using our products. For the manufacturing industry, we’ve built controls panels for plastic extrusion, electrical panel boards, and more. For engineering firms involved in the solar industry, we have built a number of control systems. Hegwood Electric fabricates control panels for numerous different processing industries. From food processing, chemicals, and more. We have over 48 years of experience to assist you with your control needs. Hydraulic power units, valve control, duplex pump control, steam control, and hydraulic machine control panels have been build by Hegwood Electric. These control panels are located globally and vary in voltage and frequency.